Here is a sample of the feedback that we get from our clients moving overseas. They've experienced Taylor International Moving services first hand and know that 'Taylor takes care'. "The team arrived on time, were polite, helpful and had a sense of humour. There were issues with a new electronic documentation system which where handled well; I wish my IT support were so patient and understanding." "Fast and efficient. Moving was a breeze"
"Great international moving experience. Very professional service, from the early information package all the way to the delivery of the items. Highly recommended, would use them myself again in the future or recommend them to anybody seeking a professional and reliable moving company." "We highly recommend this company for moving, especially if you are moving Internationally. The staff that came to our home were very polite, respectful and hard-working. The office and support staff are also amazing, nothing is too much trouble - 10 out of 10 so far! Thank you Taylor Moving :)"
"Great service, very friendly staff. Clean, efficient and on time"
"Bryan, Connor and Nolan did a fantastic job. Bryan was very clear and helpful as the lead. I would recommend you to anyone - as long as the stuff I shipped to China with you gets there!" "The crew that came to wrap, pack, label and finally loading all the boxes were very professional it was a good experience having them working in my home." "Quick, efficient and friendly -great job overall"
"The Taylor service was a very positive experience. We thank the crew for their care and very hard work. We can highly recommend Taylor service. Jindra and Ivo"
"Staff really helpful and friendly. Good job, done well and quick." "They were very professional. Had absolutely no problem." "Easy, reliable and professional moving company with excellent communication and attention to detail. Highly recommend!" "Excellent support and very friendly and informative staff"
"All very friendly and helpful staff, we are extremely happy with the professionals at this company! All our questions were answered quickly and efficiently. And on moving day our items were all packed with great care. I would recommend this company to anyone moving overseas as my family is, or even short distance moves. It is truly satisfying knowing that your belongings are in good hands." "Great service, door to door. Packing and unpacking was smooth and professional. Would happily move with Taylor again." "Team did very well. Professional service"
"Having recently moved to the land of the maple leaf from the UK, we used Taylors as part of a recommended international movement package. Thorough out the process, Taylors were impeccable at giving regular updates on the whereabouts of our sea-faring container and how it progressed through customs etc. When it came to 'unloading day', we had a crew of 3 who worked at a Herculean pace unloading then re-assembling our container-ful of 'stuff'. Continually, clarification was sought by the team from my Wife and I ensuring that the right 'stuff' was deposited into the correct room. Very efficient and impressive. We will be using Taylors again for our next move in 12 months time. Many thx once again The Macdonalds"
"Thanks so much for the extremely professional services!" "Crew moving my belongings into 2 Old Mill were great - communicated in advance, turned up on time, got the job done no issues and took all the mess away - very happy with the inbound service for my possessions - thanks." "Enver and his team did a great job! Peter"
"Absolutely perfect service to best satisfaction, we will TAYLOR recommend definitevely to others"
"Really appreciate all your help, Steph, it was all well organised with a very supportive approach. You’re a star!" "Dear Arthur, I would like to thank you and all the Taylor moving team for the professionalism in your work, if I would ever move things across again would definitely choose you guys, that being said, won't be doing it anytime soon." "Darra was amazing to work with, even when I wasn't. She's a consummate professional who made this stressful move bearable. The moving crew were prompt, clean and friendly." "Actually, I wanted to send you an email to say thank you right away after the move - on the same day - still before your email. But unfortunately I was pretty busy the days around the move and after that I just forgot about it. The moving day went very well. My husband was also really enthusiastic about the staff from your Russian company on the moving day itself. They were really fast and thoroughly. Dear Stephanie, once more, thanks a lot for your support, your detailed emails, quick responses....just for your huge help. You guys did an amazing job and we were satisfied with the whole process and your company. Best regards to Toronto (we definitely do miss this awesome city) from Moscow (we had already the first snow flakes).."
"The Taylor team was perfect"
"thanks Arthur Drewry for all your help with so many moves! Amazing service!" "Our move from Canada is now complete. Everything arrived safely. I have checked all the fragile items and everything is in perfect condition. Many thanks to Taylor in Canada and Mark Lehman & crew. Many thanks to the Balderas team – Marcela, Mauricio, and Grecia, Javier & crew. Whenever anyone asks who is the best mover, we know to recommend your great team." "Outstanding crew on the delivery and putting goods together. Thank you to all for making a stressful process bearable and even fun"
"Dear Darra, Thank you, all boxes have been delivered. I would like to point out also that your delivery people were extremely professional and went out of their way to please. Thank you again." "We have made several intercontinental moves, and the packing process with Taylor has been the least stressful we have ever experienced. The crew was efficient, calm, cheerful and utterly professional. I was very impressed with every aspect of the process and would recommend Taylor without hesitation." "I was not personally present when the goods were collected but my neighbour who supervised everything on my behalf indicated that she was very impressed with the crew who did the packing and collection. She indicated that your crew were very pleasant people and appeared to be very thorough and careful in all of the wrapping and packing. Indeed, my neighbour indicated that she would certainly look to your company herself if and when she moves in the future. So far a very positive impression!" "Thanks for the coordination. I have received all my stuff today at my house. Delivery is completed. Thanks for your tremendous help guys. You made it easy for me." "Thank you so much for all your help from your office staff they were excellent." "Everyone involved with the move so far has been fantastic. I don't know what we would have done without Linda's patient help before the move. On the day of the move, Ralph was impressively professional, and was a great help when we discovered we had packed something important by mistake and had to dig it out again. I would absolutely recommend Taylor." "The crew performing service was amazing! They worked very fast and good! Was very happy to have them and would definitely recommend Taylor Moving!" "Excellent service from Darra and the van crew were friendly and courteous. They were keen to ensure that everything went in its place and could not hae been more helpful." "Arthur and the crew that came (Mark and Robbie) were very helpful and professional. Thank you!" "Our salesperson Arthur was amazing. He put us at ease right away. That is why we chose your company. The crew was very professional and courteous"
"Everyone at Taylor was exceptional in every way. From the first call to the final move, everyone did everything they could possible do to make this experience as pleasant as possible for me. For Steve, Stephanie, Tony, Kevin, John, Enver, Kyle and Allistar, my heartfelt gratitude. I have written a more detailed letter to Russ to congratulate him on having the absolute best company to work with I have ever experienced. For now, know that I appreciate the pleasure to work with such outstanding people. Thank you"
"We are delighted with the service from Taylor International concerning our move to Scotland and subsequent return to Canada which were both handled entirely from the Head Office in Burlington, Ontario. This included packing, shipping, customs clearance, delivery and unpacking. During this process we were kept fully informed of our shipments progress by the agent assigned to our contract. We would highly recommend Taylor's International expertise to others wishing to deal with a company in which they could have full confidence knowing their goods were in safe hands. All the best to Taylor's International for the future." "Hi Linda, Your guys did a great job over the last three days in packing and loading our belongings. Please pass on our thanks again to them." "Excellent service from start to finish. Darra was always responsive. The movers (Matt? and one other) were friendly and prompt. Everything went smoothly"
"Would always recommend Taylor's for this. Great job as always." "Extremely smooth service. Darra was very knowledgeable throughout my process and was prompt with all replies. Ralph delivered the shipment and was friendly and quick. A great company to deal with!" "Hi Darra, My household stuff was delivered and got everything in perfect shape without any damage. I am very much appreciate the service provided by you and your associates. Convey my special thanks to Global movers team in India and country wide moving team in Saskatoon. Once again thanks a lot for your great support." "Great team! Very hard working crew. I will recommend Taylor Shipping to all of my friends and colleagues. This was the easiest move from half way around the world. Thanks!" "The crew who came to pack and move the furniture were excellent. They were efficient, well mannered, great representation for your company"
"Hello both I just want to say thank you for the service and support of your team the shipment arrived last week no problems Robinsons this end were also excellent." "The Taylor crew were the best moving crew I've ever had and I have had a lot. They were wonderful. Courteous, hard-working, tidy and efficient. Great job." "Ralph and John did and excellent job. They were friendly and pleasant guys. I didn't get the name of the young guys that moved the stuff from the house but they were very careful and also did a great job. Your employees take pride in their work and exhibit excellent customer service." "Hi Mirjana and Jenn Wanted to thank you for the great Support and perfect move! Everything went well! Best Regards Stefan"
"Your crew: Toni, Kevin, Steve, Derek and Nicolaus could not possibly have been more efficient, kinder and compassionate. Many thanks for making it a very positive move,"
"Russell and the boys were fantastic on Saturday. Really polite, respectful and friendly. Left the condo in an excellent condition and everything placed where we wanted it. Can't recommend the team enough." "We have used your company a few times and wouldn't hesitate to use you again plus recommend you to anyone." "Thanks to Donna, that kept in touch, updated me on the progress and took time to explain the process. Great employer indeed." "Good afternoon Linda, Thank you very much for your email and confirmation. I wanted this opportunity to express my thanks to you for all your help and to the gentlemen who moved us last week. It was a pleasure to work with them, as they were extremely professional, efficient and reliable." "Everything went smooth! Comfortable to recommend you to my friends if the same service is provided at the other end and if the goods are delivered in good condition. Thanks, Elton"
"Fanatstic and friendly Service and Team"
"Just have to say that the whole process was professional in every way!" "Sorry for the late response, but thank you so much for this. I was really impressed with how efficient the packers/movers were! It made it all so easy for us!" "Hola Linda. - thanks to everyone at Taylor International for the great job! - our Lift arrived last night. The guys from Marcela Balderas were great and unloaded & unpacked in an hour. - everything arrived in perfect condition! - we couldn't be more pleased..... - thanks again,"
"Hi Donna – everything went very well with our move in and both my wife and I were very happy with the service. Also just wanted to thank you personally for the outstanding support and responsiveness throughout our entire move process – you have done a great job ! Best Regards, John"
"Hello Linda The moving day went well thank you, and please pass on our thanks to the guys who did the packing. Also thank you for all your assistance in making this move go smoothly." "It was a great experience to work with Jenn Maynard, Matt Czernikiewicz and the moving team." "very professional and overall well coordinated move. would recommend you definitely. thanks"
"Thank you very much for a painless experience. Would certainly recommend to anyone." "Everything about the move was outstanding, right from the initial consultation to the packing, storage and finally the delivery and unpacking. The team was courteous and considerate throughout the process, and was quick in responding to my email queries. I want to thank Tom and Jenn (Canada) and the movers Mark (Canada) and Carl (UK) for their excellent and professional services." "I really could not fault any aspect the move to date including liaison with the office. Nothing was left for me to worry about! This is my second time of using Taylors and I would without hesitation recommend them to anyone who is thinking of moving." "I have moved internationally a few times now and l'd have to say by far both Arthur and Jenn have excelled and made this the most pleasant experiences." "Dear Donna, Our thanks and compliments to you and your professional customer oriented and personable crew. Everything went swiftly and smoothly. We were very lucky with the weather or maybe it was not luck - you just organized it"
"Dear Jenn, I can confirm that the packers came today at 9h30 as scheduled. They were really professional and effective." "Linda Everything delivered here last night ... I only opened the mattress becuz we wanted to use it ... Everything is very well packaged and looks good ... I will be opening the rest at the end of next week because of the current state of renovations ... Thank you for your assistance ... You guys do a great job"
"Hi Linda, Thanks for your note. Everything went really well with the delivery – it arrived in the expected window with no damage. Thanks for all your help." "couldn't have been happier with how everything went!!!!" "I want to thank you all for your help, and to say how fantastic Enver, Randy, Chris, Tony and the lads today doing the lifting of the London shipment were – cheerful, efficient and quick – I can’t believe they did so much in such a short space of time! Please pass on our compliments. I look forward to hearing from you, All the best, Andrea"
"Hi Jenn, All done! Everything went smoothly and I was really pleased with the entire experience." "Donna Murray was SO helpful all the way through the process, and the men that unpacked the stuff were polite, pleasant and worked very quickly. Job well done. Thanks." "Your coordinator, Donna Murray is very helpful and accountable. I will recommend Taylor again." "CREWS VERY UNDERSTNDING AND SYMPATHETIC TOWARDS OUR REQUESTS / NEEDS THANK YOU!" "Thank you very much for the assistance provided in making the relocation process as smooth as possible." "Thank you for your professionalism. It made our move as stress-free as possible. It was a pleasure to deal with Taylor, and we're grateful for your integrity and honesty. Everyone from Matt and Linda to the movers and their boss was efficient, friendly, and helpful. A special commendation is due to the driver of the container truck for the amazing way he managed to manoeuvre through our challenging property entrance! Thanks again,"
"Everything went very smoothly from start to finish. Thanks to Donna for all her help with every step." "My compliments to you for having an exceptional crew. Both the packing crew and movers were extremely professional, hard working and genuinely good guys. They were all extremely helpful and accommodating. The entire experience from the day we met Greg and yourself has been great and we appreciate all of the hard work." "I recently relocated from Toronto Canada to Perth Australia with my husband and two small children. The whole experience was seamless and fabulous. From the initial quote, packing and removal to the delivery in Perth, every person that I dealt with at Taylor's was helpful, knowledgeable and accurate in their advice. I was so pleased with the entire process and thoroughly surprised by how smoothly everything went. Thank you Taylor's I would recommend you without any hesitation." "Donna, Apologies for to getting back to you sooner, but as you can appreciate we are up to our necks in cardboard and plastic. The boys that delivered the consignment did a first rate job very professional indeed. Based on our experience, we would certainly recommended your company and services to others." "Just wanted to follow up after the pack and move yesterday. The crew (Ralph, Jim, Tony) were great!" "Donna: Many thanks for arranging the transfer. Simon, David and Jeremy were TERRIFIC!!! They were very careful with all items and clearly showed excellent packing of the unit... our thanks to them. We will surely use Taylor again in the future to move our home to a place once we settle as we are impressed with the services from your company." "Hi Jenn, I have moved between so many countries over the last 30 years and with many different movers, Crown, Four Winds, Ags just to name a few. I know a good move from a bad move and I certainly know a move like mine that was on short notice and a split move on top of that would have been a challenge for many but you were fantastic and held my hand too as I was so stressed (and jet lagged). I know i've said it before but you have been amazing and I hope your company recognizes and values what a great asset you are to the company!! Please feel free to share this email with your manager and tell him you deserve a raise!" "My experience so far has been lovely. I had received estimates from three different movers beforehand and Taylor was the only one that gave a good sense that they would help me walk through the process safe and sound. The quality and quantity of organized information and friendly staff inspired a lot of confidence. I really enjoyed the gentlemen that came to pack us up too! Friendly and assuring. Overall an excellent experience so far!" "very happy with the service, especially the delivery guys who were very professional and friendly. I can't remember their names but two thumbs up to them." "Hi Jenn, How are you today? I just want to let you know that the movers have done an excellent job! The were all very pleasant to work with and they made the packing and loading a smooth operation. Thank you very much!" "Hi Linda Yes it was cleared and unpacked today I will be arranging collection on Friday .I would like to thank you for a great job ,and keeping me informed of every stage of the shipment. Best wishes to you Linda"
"Hi Jennifer, I really would like to say Thank you to your whole team. Actually moving is not really fun but your team makes it to be fun. Everything went so well and all of you made a great job. I really appreciate it, please let everybody know how happy we were with Taylor ." "Thank you and your team for a smooth/seamless process thus far. 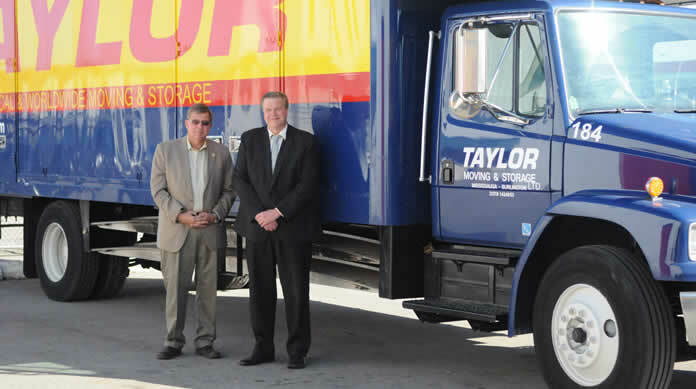 It has been a great pleasure working with Taylor Moving." "Your crew and service was outstanding !" "Hi Donna, Just to thank you for your assistance and support, and Taylor Moving for an excellent service. Your people arrived on time, acted professionally, clean, organized, quick and diligently removed all waste, and were willing to cooperate with item location at our home. Best regards,"
"Five stars! I couldn't have asked for a better firm to do a complicated international move. I have to call out Jenn Maynard as her attention to customer service was beyond expectation in all regards. I hope you recognize the significant value she brings as the face to your business."